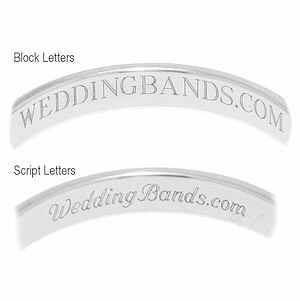 WeddingBands.com offers free engraving at the time of every purchase of a wedding ring from WeddingBands.com. All engravings are on the "inside" of the band. Please limit the number of characters (including spaces) to under 50. All free engravings will be provided in standard script (combination upper/lower case) or Roman [Block]. You may select your preferred style at the time of choosing your ring style and size. All engravings with upper case lettering will be engraved in block unless specified. Depending on the language and the characters used, we can sometimes engrave in other languages. Common languages we have engraved in before include Spanish, French, German, Italian, and Hebrew. Please keep in mind we can only fulfill the request as long as we have suitable characters for the language and final confirmation from you on the engraving. If you have another language not listed here and want to know if we are able to engrave in that language, please contact our Customer Service. Our customer service representatives will thoroughly answer your inquiries. We will do our best to accomdate your engraving requests. However, some of our ring styles may not be suitable for engraving as requested.